Head over to your local Home Depot for a great FREE Kids Clinic on Saturday April 2nd from 9 AM – 12PM. 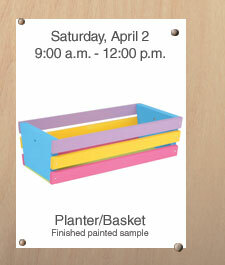 This week, kids will be making a Basket/Planter. What a cute craft to make and give to Mom as an Easter or Mother’s Day gift! All supplies are FREE! Kids Clinics are every 1st Saturday of the month and each month is a new craft!